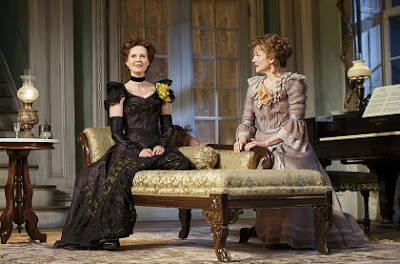 Cynthia Nixon and Laura Linney in “The Little Foxes.” Photo by Joan Marcus. TONY! TONY! TONY! Tony fever, Tony fervor. Of course, until the CBS telecast of "The 71st Annual Tony Awards" at 8 on Sunday night (11 June), we won't know the results. Truth be told, I'm happy not to make the big decisions on behalf of the Broadway theater community. I like being a gadfly, irked by some choices the Tony poobahs make, buoyed by others. Sure, I'm passionate about some performances and productions, but like Ado Annie, I "like the one I'm near." So, yes, to some extent, last comes first. This fickleness was more confusing to me when I went to see everything that was on the Broadway boards. I mimicked those in charge of making the selections so that by the end of May, I could safely say I saw all of the musicals and all of the plays contending for the best in Tony's eyes. This season, I confess, I have seen few of the shows on the short list. Sally Field and Joe Montello in “The Glass Menagerie.” Photo by Julieta Cervantes. In the Featured Actor in a Play slot, I witnessed three out of five performers. Richard Thomas is an intense Horace Giddens in "The Little Foxes," but Horace provides a moral ballast in a play of consuming evil. Danny DeVito walks away with "The Price" in a production that lacks a lot of other sparks. 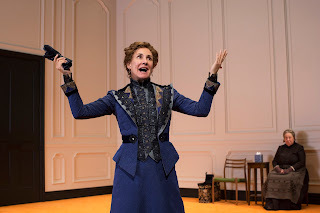 (Jessica Hecht should have garnered more attention for her Esther Franz in this Roundabout Theatre Company revival). The third supporting actor has been touted for his classical theater chops in roles such as Julius Caesar in Shakespeare's play of the same name. John Douglas Thompson is a solid presence as Becker in the Manhattan Theatre Club revival of August Wilson's "Jitney." Though RT broke my heart with the decency of his Horace, DDeV brings life, color and interest to "The Price" and should be rewarded for his efforts Sunday night. On the distaff side, of the five nominees for Featured Actress, two are from "Sweat," two are from "A Doll's House, Part 2," and one is from "The Little Foxes." Cynthia Nixon belongs in the Lead Actress category as a co-star to Laura Linney with whom she splits the role in "The Little Foxes." She will, however, have to settle for the statuette for the featured role. Now for the female leads. Since I did not see either Jennifer Ehle in“Oslo” nor Cate Blanchett in “The Present” – or for that matter LL as Regina in “The Little Foxes,” – I am narrowly choosing between Sally Field as Amanda Wingfield in “The Glass Menagerie” and Laurie Metcalf in “A Doll's House, Part 2.” SF is a sensational Amanda, by turns deluded, protective, self-absorbed, but my Tony goes to LM for her charismatically poignant Nora. On very small evidence, I am rooting for “A Doll's House, Part 2” for Best Play, as well. Its creator, Lucas Hnath, is a luminous new voice in the theater. I am also partial to Lynn Nottage, and her “Sweat” seems like a major undertaking. Meanwhile, this season's big musicals have eluded my notice. I mourn that “Bandstand” did not get more recognition for bringing swing to the Broadway stage and for its heart (a gap perhaps already filled by the inclusion of “Dear Evan Hansen” and “Come from Away”). At any rate, the smart bet – and buzz – is for “Groundhog Day,” which, along with its star, Andy Karl, is reported to be this year's best. In the Best Play Revival category, I think “Six Degrees of Separation” may get the win. “Falsettos” is a likely Best Musical Revival, although my heart belongs to “Hello, Dolly!” starring Bette Midler. Laurie Metcalf and Jayne Houdyshell in “A Doll’s House, Part 2. Photo by Brigitte Lacombe. The televised show, this year hosted by Kevin Spacey, is always spectacular and gives viewers a taste of the talent that's on Broadway. That, in and of itself, is a win-win proposition.